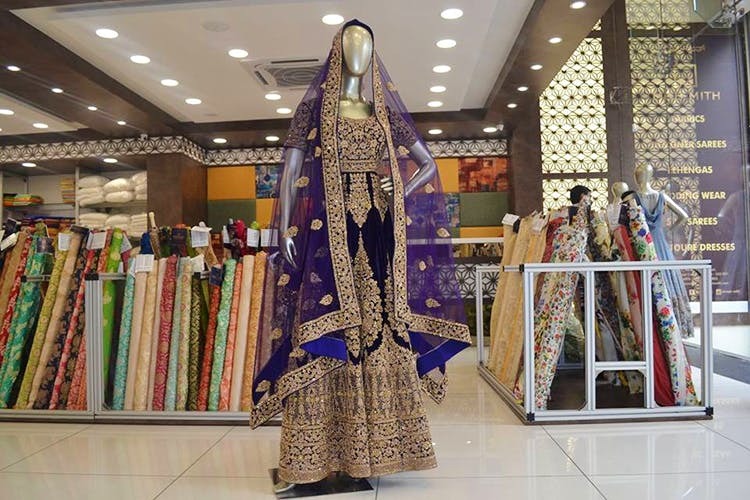 Spread across two floors, Moh-mith, on Commercial Street, is tailormade for brides and her entourage. Custom-made lehengas, designers blouses and fab fabrics are their speciality. Set a date and now looking forward to putting together a jaw-dropping trousseau? Well, Moh-mith, on Commercial Street, is a bride’s dream come true. About a year old, the swanky store looms large on Narayan Pillai Street, that’s just off Commercial Street. One section of the store is dedicated entirely to fabrics. So, if you are looking to make your lehenga or blouse from scratch, then, swing by here first. You’ll be able to browse through a variety of offerings from imported lace (that’s great for a gown) to traditional silks, Banarasis, and netted fabric with intricate embellishments. Once you pick the fabrics, they’ll hook you up with their team of in-house tailors to craft the outfit of your choice. This can take from a week up to a month to make so make you sure you get her well in advance. Apart from the custom clothes, you can also pick up blingy salwar kurtas sets, Kanjeevarams and they even stock menswear here. Do come in with a clear picture of what you want, especially, if you are going the non-traditional route with your lehenga or blouse design. The in-house tailors may not be the best to design an outfit from scratch for you.